Ocean City, MD – (August 10, 2018): Although a fine art event is not new to the portfolio of special events in Ocean City, a cultural exhibition with a wide array of offerings is different for our coastal community. ArtX, which focuses on artistic expression as the fundamental theme, will celebrate its inaugural year August 25-26 at Northside Park. Allowing it to grow beyond the boundaries of the 17-year-old Art’s Alive event, ArtX will host fine artisan exhibits, musical performances, activities, short films and paid workshops by the Art League of Ocean City. ArtX will feature art categories including painting, drawing, sculpture, ceramics, photography, mixed media and fine wood. Visitors can take in artisan demonstrations, participate in children’s activities and go one step further by joining an Art League of Ocean City workshop on site to polish their own ARTistic Xpression. At the end of the first day, guests can stay for a special concert by The Original Wailers – produced and sponsored by T.E.A.M. Productions. 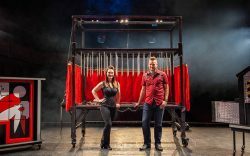 This special free concert will take place at 8 p.m. on ArtX’s West Lagoon Field of Northside Park. Bring your own chairs or blankets for seating. ArtX will feature additional music from up and coming artists on the outdoor stage, including Robert Paul Canfield, Pressing Strings, Rivers and Rhodes, Cecilia Grace Taylor Knox and The Breakers. Paige Glass – a 13-year-old singer and songwriter, and BITSUNE – an up and coming electronic music duo out of Spain, round out the list of talent to appear on stage at ArtX. For the film enthusiasts, ArtX offers the best of the best from Art League of Ocean City’s Film Festival. Short films and documentaries are scheduled both days with opportunities to interact with the producers. Saturday brings in films from Ocean City locals and films about Ocean City. Sunday focuses on youth films in the morning and documentaries in the early afternoon. Food and beverages are also available on site including a selection of beer, wine and craft beer benefiting the Art League of Ocean City with special thanks to ShoreCraftBeer.com. Event hours are Saturday, August 25 from noon to 8 p.m. and Sunday, August 26, from 9 a.m. to 3 p.m. The event is quickly followed by Sundaes in the Park at Northside Park, which includes live music by Ragdoll (a Frankie Valli Tribute Band) and fireworks. 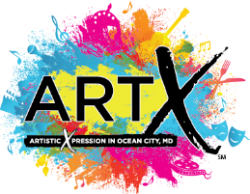 Please Note: ArtX is a joint production by the Town of Ocean City Special Events Department and the Art League of Ocean City. For additional information on ArtX, it’s activity schedule and layout in Ocean City’s 58 acre Northside Park, call toll-free at 1-800-626-2326 or go to OCocean.com.